I am excited to be leaving on a long planed trip to France. This started with a little bucket list dreaming with the 24 Hours of LeMans making my short list. After some research, I decided to book a trip with Travel Destinations in the UK. They have a private campground situated directly on the Porsche Curves. As a first time attendee, I felt that the “handholding” that a agency would provide would be beneficial. I don’t mind camping, as this seems to be part of the appeal of LeMans. So I booked this trip 9 months in advance, as I was told they sometimes sell out by Christmas. As the trip got a little closer, I discovered that there would be a F1 race at Circuit Paul Ricard the following weekend. I will be honest with you, I think F1 ticket prices are, shall we say, ridiculous! And I needed to get back. So I compromised and bought a ticket for the Friday sessions, which should allow me to see the cars at speed on the track, which is really all I need. In between LeMans and F1, I plan to head to Grenoble for a night in a hotel after a week of camping. Do some laundry. Then my plan is to do some Alps sightseeing in Ecrins NP. 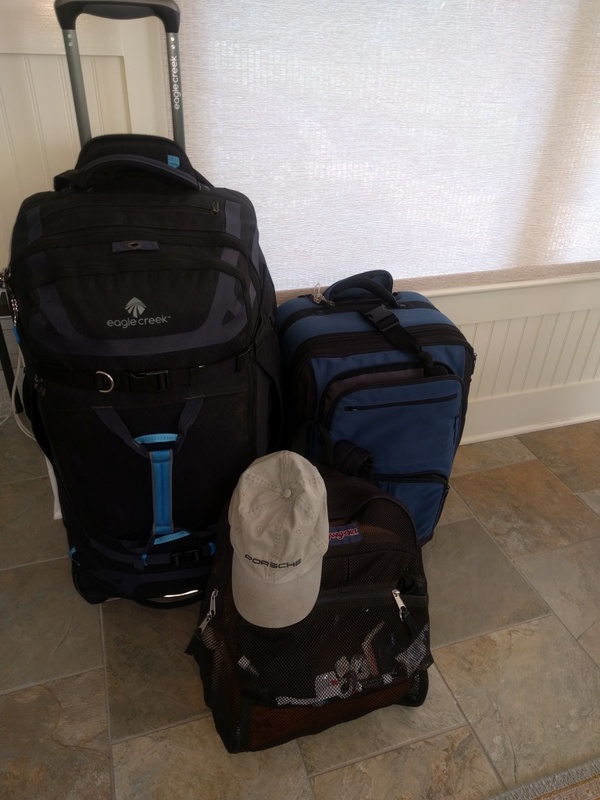 Knowing I will be “car camping” for the most of the trip and knowing that I have to meet airline baggage restrictions, I have carefully curated my gear to meet Delta’s requirements. I scored a nice Eagle Creek roller bag at the REI garage sale, which is the basis for my one checked bag. The first thing is that a checked bag has dimensional limits, which this piece meets with a little room to spare. The second thing is the 50 pound weight limit, which they will verify at check-in. This is where you can get in trouble. The Eagle Creek bag contains pretty much everything I need to camp. I purchased some very nice, very compact, backpackable equipment from REI manufactured by Helinox. I got a camp chair and a cot. This stuff is pricey but very thoughtfully constructed. Not only is it light but it doesn’t take up much room in your pack. I packed by trusty Mountain Hardware 2 man tent, the cot, the chair, an air mattress, one lightweight and one medium weight sleeping bag, cook set, collapsible water jug, miscl food prep items, and a bunch of dried backpacking meals. The ones where you just add boiling water. Total weight was 45 pounds, under the 50 pound limit. That leaves just a couple of things that were out of the question to bring on the plane, that being a propane single burner stove and a cooler. I plan to stop at the Decathalon store in Paris on my way out of town to get those items. The carry-on roller bag contains my clothing. The weather forecast for Ecrins shows overnight lows in the 40’s, thus the medium weight sleeping bag and some layers. Fingers crossed but right now the forecast for LeMans and Paul Ricard does not show any significant chance of rain. On the other hand, the Alps look pretty wet. I’ve got my rain gear packed and ready to put into play. The small mesh bag contains all the stuff I carry to make my 65 year old body survive long plane flights. Included are an inflatable seat cushion and neck pillow. Not being able to justify the price of business class, my latest gambit is to spring for Delta Comfort, which gets you a little more seat recline and spacing. Then I try and get the bulkhead seat. I couple this with what is basically a large square blow up ball that allows me to prop my legs out close to horizontal. Not quite a lay flat seat but a big help. Also included are active noise cancelling ear buds, off line music downloaded on my phone, and a Nook reader. Air time from NC to Paris is about 8 hours so I guess I’ll survive. I’ve also downloaded off-line Google maps to my phone. I have found this works pretty well and avoids having to pay to have your phone connected to the local cell service or having to rent a GPS unit from the car rental agency. My car is being rented from Hertz. 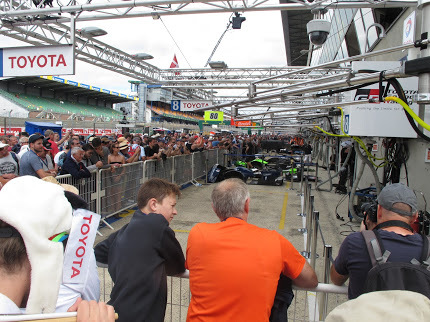 What a great time I had at LeMans! I went with my son-in-law Andy. We arrived at the DeGaulle airport in Paris on Wednesday morning, picked up our rental car, stopped at a nearby Decathlon to pick up a camp stove, gas, and a cooler. 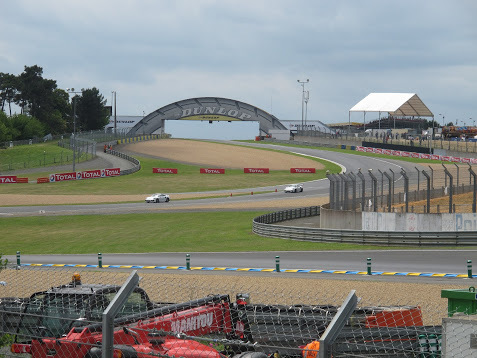 Then on to LeMans, which is about a 3 hour drive. When we got close, we struggled a bit with directions but finally found the Travel Destinations check in. They took us to our assigned campsite. Our neighbors, Pete and Jane, were already in place next to us. 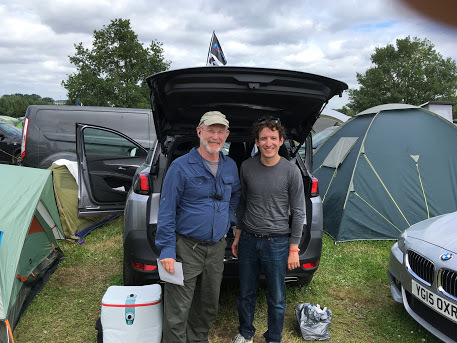 Pete has been to LeMans a number of times and he gave us some valuable tips throughout the weekend. The on track action started shortly after we arrived with practice and qualifying. The cars entered in the 24 hour race practiced as a group. 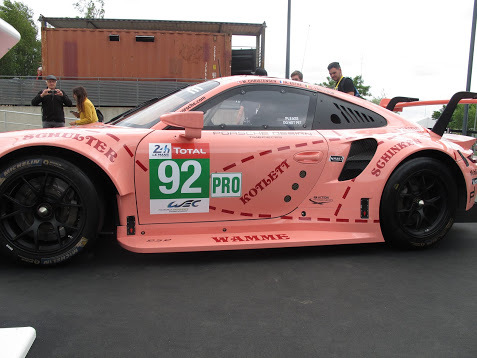 Separate groups included the Road to LeMans cars, the Porsche Cup cars, and the Aston Martin festival group. Cars were on track until midnight. Our Travel Destinations campsite was at the Porsche curves. The P1 cars look incredibly quick as they go through this complex of curves. As night fell, the experience was even more surreal. 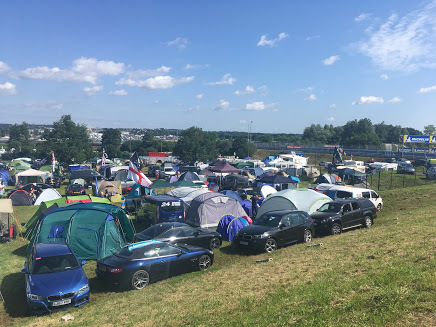 Porsche Curves campsite- mostly Brits! Thursday included all the various cars on track for practice and qualifying, all day long and into the night. Friday is an “off day” with no cars on track. In the morning we did the pit walk. It was a tad crowded but we were able to look directly into the garages for the cars entered in the 24 hour race. Friday afternoon was the parade in the town of LeMans. It was a good show, although Andy and I noted that there were long gaps between the parade entrants. It was kind of like Mardi Gras, with various trinkets being thrown to the crowd. 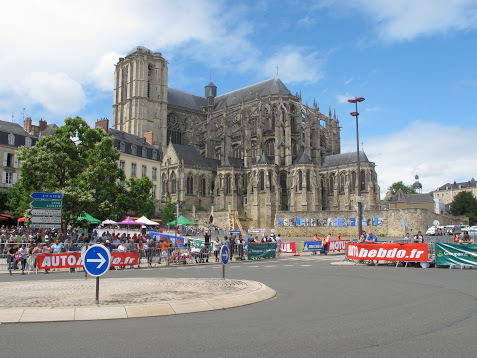 Below is a picture of the parade route in front of a nice cathedral in LeMans. And on Saturday, it was the big race. Various support races occurred in the morning, with the main event starting at 3 pm. 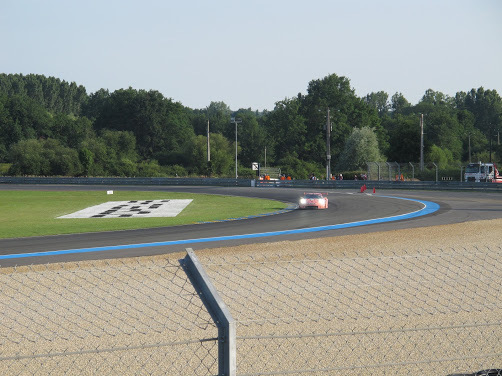 Our game plan was to work our way up the track from the Porsche Curves all the way to Tetra Rouge. We did this but it was very crowded. I was so amazed at the size of the crowd, especially as compared to sports car races in the US. It was just a sea of humanity. A lot of grey haired guys of course, but also a lot of younger people, couples, kids, even school groups from the area. It was a very festive atmosphere. We got back to our camp in the evening and fixed a meal. After it got dark, we took a bus up to Indianapolis and Arnage curves. This was very cool to see at night. 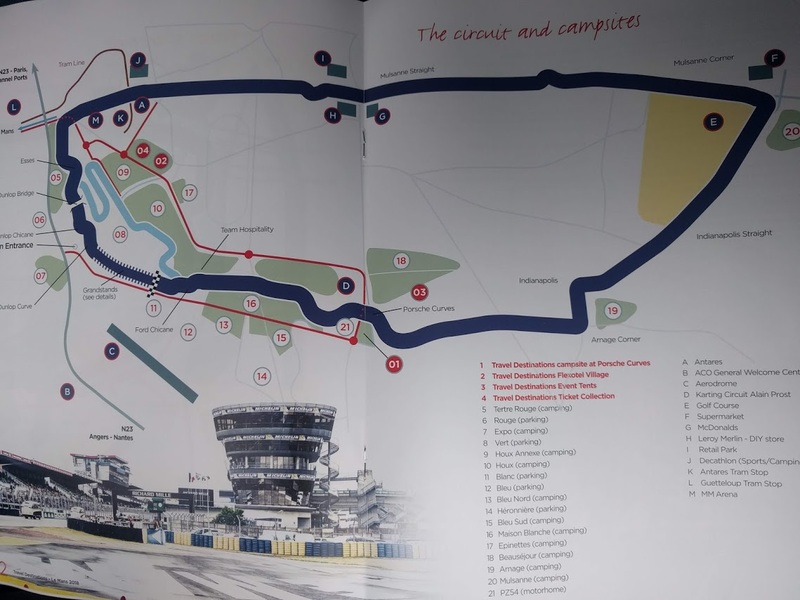 We would have liked to move on to the curve at the end of the Mulsanne straight but even after midnight, the buses were very crowded. We got a few hours sleep by huddling in our SUV, which insulated us from the noise somewhat. As daylight broke, the race still had many hours to go. We did another circuit of the track, planning to be just past the finish line at 3 pm. This worked out pretty well. 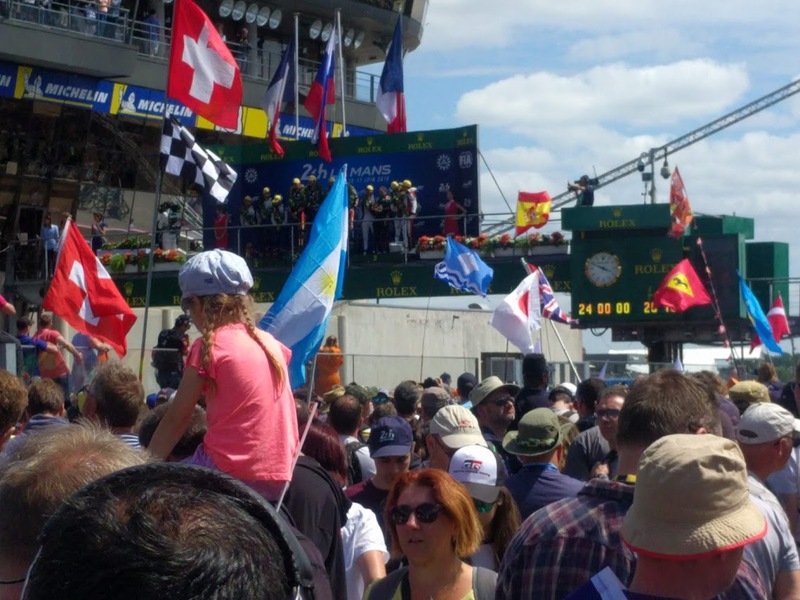 After the race was done, we joined the crowd that was let onto the track for the podium ceremony. I was surprised to find that we could get pretty close to the podium. 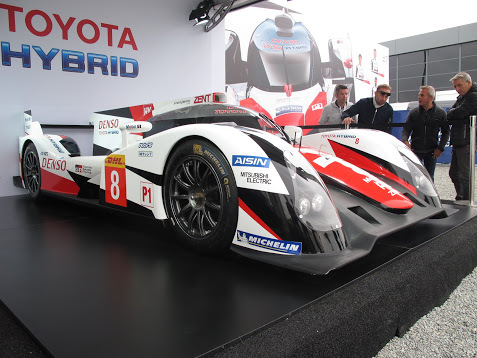 Of course, Toyota finally won the overall title. It’s never a sure thing in a 24 hour race but their 2 cars won going away. The Porsche RSRs did quite well, placing 1-2 in their class. And Patrick Dempsey finally was a winner in the Am category. All in all, it was a fascinating experience. I’m not sure it is something that I will want to do every year but I am glad I got to go once. The crowds were great, the racing was interesting, the cars were very fast, and it was quite the multi-cultural experience. Everyone should do it at least once. Grenoble and the Alps …. My son-in-law Andy had a rail ticket back to Paris but due to the on-going French Railway strikes, I decided to drive him back to Paris after the race. We were very surprised to find traffic to be very light coming out of the track when we left about 3 hours after the race completed. The next morning, after seeing him off to catch his plane, I drove from Paris to Grenoble. That travel day was the only day of the trip with any real rain, which was certainly very nice. 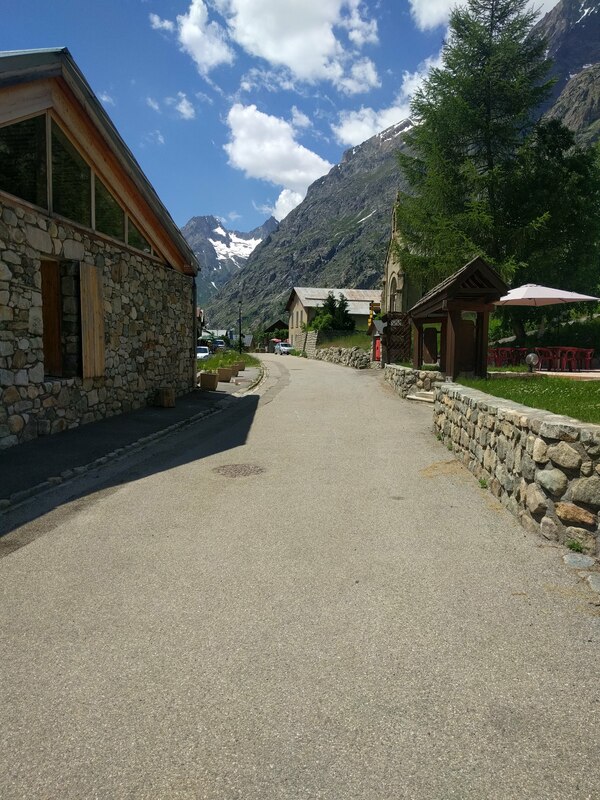 After spending the night in a real bed, having a real shower, and doing some much needed laundry, I headed off for the Alps, specifically Ecrins National Park. I had previously reserved a spot at a campground in Venosc, Le Champ du Moulin. It is a very nice campground. Since it was available at a reasonable price, I decided to rent one of their apartments. 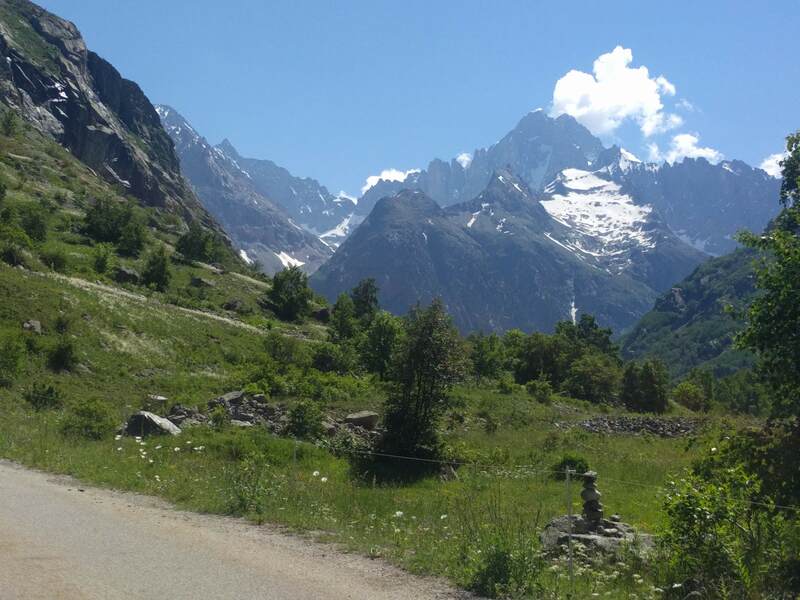 That day, I drove up the road to the Alps de Huez. It’s hard to believe that the cycling record for this climb is 32 minutes, as it was hard to hustle my rental car up in that amount of time. The next day I made a very aggressive hike, basically straight up for 4 miles, to an altitude of 2130 meters. 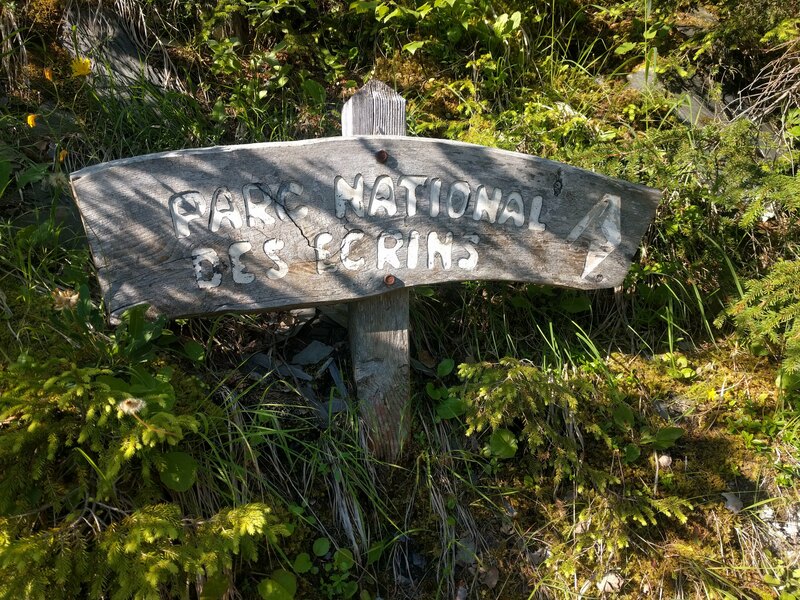 Unbelievably, there was a NP Refuge at the end of my hike where I was able to buy a cold beer! Most of the supplies are brought in by helicopter. My legs were fried by the time I got back down but it was worth it. The next day, I hiked to another destination, just a scenic. I love getting above the treeline and this national park did not disappoint. Fortunately the weather was mostly clear so I got to get a full view of the spectacular scenery. After finding out how far the Paul Ricard track was from Paris, I decided to forgo my 1/2 day trip to the track for F1 practice. As such, I had a fairly leisurely drive back from the Grenoble area to Charles de Gaulle airport. My flight home was uneventful. All in all, a great trip that filled two slots on my bucket list!